At the beginning of the year, I wrote about Looking for the New Things. Isaiah 43:18-19 seemed to be everywhere I looked, which wasn’t too surprising, as it’s often a favorite at the dawn of a new year. It stuck around for a couple of months, and then I stopped noticing it, but didn’t forget about it. When life went awry, which it has, is, and will continue to at various points, I went back there. I asked a talented friend to make me a nicer piece of wall art to hang in my room, and even bought a frame to make it look official. I clung to that verse like it was a life raft. In ways, I suppose it was. Is. And I waited, and prayed, and waited. And more of the same, likely with some impatient feet-stomping to show God I meant business this time. So much waiting. Many stories of faith could be summarized with that one word. In the past month or so, Isaiah 43:18-19 again seems to be everywhere I look–so much so that when I read a book or blog and the writer said, “There’s a verse that means so much to me…” I’ve started expecting it to be Isaiah 43:18-19. And lately, it usually has been. But it’s also forced me to notice it. A way (or a path, I imagine) or a river seems like it should be pretty noticeable. But I haven’t gotten those. Maybe, though, the reappearance of this is A thing. Not the thing, or a major thing, but A thing. Over and over, being I’m reminded to have hope, and to see. I love the boldness of Behold. It is booming, rich, inviting–see here, look, pay attention. You don’t want to miss this. I don’t know what that “new thing” might look like, though I certainly have my list of suggestions for God–but my biggest hope is that I have the eyes to recognize the newness even if it doesn’t look like I thought it would. This particular year is much closer to its end than its start, but this promise, this hope of new things doesn’t end simply because the year does. Sometimes the waiting time is much longer than we’d like to be, but we still have reason to hope. p.s. Have you seen God doing new things? Or are you still waiting? As one often does at the beginning of a new year, I’ve been thinking about what 2015 may hold for me. Last year around this time I wrote myself a letter for the end of 2014, and while I’ve certainly gone some places and done some things in the last 365 days, much of that letter still rings true. My biggest hope for 2014 did not come to be, as is evidenced by the slew of singleness posts that made my list of top ones. And hope? Well, I find that hope is often slippery. Easy to grasp for a moment, perhaps, but trickier to grab onto for the long haul. Which is the beauty of a new year, I suppose. Learning to write a different number–2015–is an unavoidable reminder that something new has come. And if there can be new years, there can certainly be renewed hope–right? 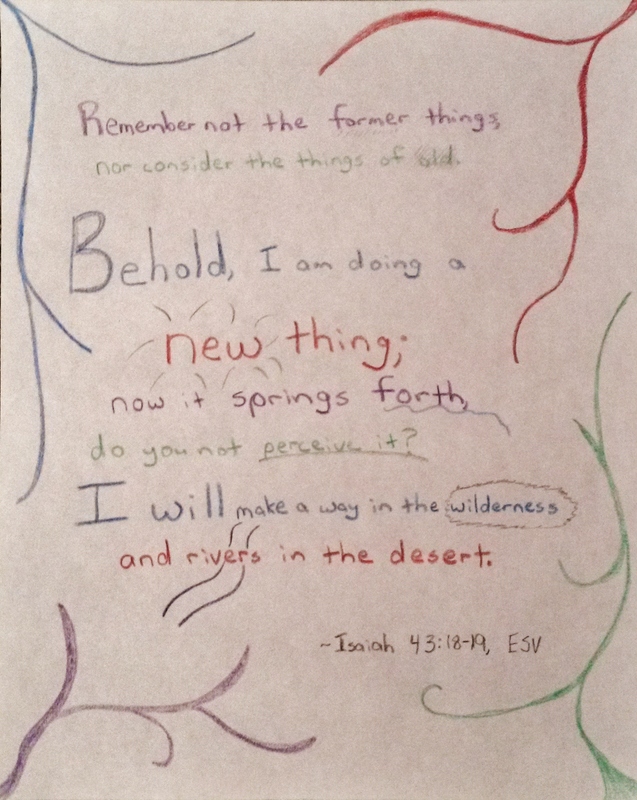 I came across Isaiah 43:18-19 the other day, and I found the words so fitting I was inspired to attempt some artwork for my wall. There is so much hope laced in those verses, hope I desperately want to cling to and claim for myself. I don’t know what that “new thing” might look like, though I certainly have my list of suggestions for God–but my biggest hope is that I have the eyes to recognize the newness even if it doesn’t look like I thought it would. p.s. What new things are you looking for this year? I’ve written to you before–to the 16-year-old version and the 28-year-old version, but never the you only a year away. It seems more intimidating this way, to write to the you only 363ish days away. I wonder what you’ve seen in those days. You’re going places soon–Denver, New York City, Nashville–the dates are on your calendar, your new suitcase waiting to be broken in. But maybe that’s just the beginning of the list. What other places will that suitcase see this year? More important than where you went, though, is who you became. What have you learned in this past year? Have you let go of some lies? Have you held onto truths? Have you loved as well as you can? Have you let God be the center of it all? Whatever goals you did or didn’t accomplish this year, whatever good or bad happened to you that you could or couldn’t control, I hope you know that who you’re becoming matters more than all of it. Maybe 2014 was the year it all seemed to go wrong, and you were left hanging onto shreds of what you thought you knew. Or maybe it all (or mostly) went right, and you stand looking into 2015 from a mountaintop of glee. Whatever the case, I’m wishing you well for wherever you are. I think we both know that your biggest hope for 2014, as it has been for several years now, is that you will find a Somebody. A Jesus-loving boy who will help you love God more each day; not somebody who will “complete” you, because you are not incomplete, but somebody who will encourage you to be more you than you’ve ever been before, who gets that God is always my aim because God is always his aim too. If that hasn’t happened, I hope you still know that you’re completely wonderful, excellent, and worthy all on your own. Maybe in this past year you’ve gotten better about comparing yourself to others, but if you haven’t yet, here’s a reminder: It’s not worth it. Your story is not theirs, and that’s okay. Look for the goodness in your own, and let them have theirs. Life, and especially this funny time of young adulthood, looks different for everyone. Embrace it. Learn from it. Most of all, I hope you’ve held onto hope. p.s. What would you like to tell yourself for the end of 2014? And I still get antsy on this day. This year I know several of my presents, because I helped pick them out, so my excitement isn’t primarily over gifts like it might have been when I was younger. I’m looking forward to giving some gifts, particularly to my nieces and nephew, and I can’t wait to see their happy little faces. In ways, these are things worth looking forward to. But my anticipation shouldn’t be entirely about gifts or food or presents. Because tomorrow, we get to celebrate Christmas. We get to celebrate Jesus coming to earth as a tiny, wrinkly baby. Incarnation. Coming to us, his people, in a way we can understand and relate to. Jesus skinned his knees and had hangnails and calloused feet and maybe dandruff and body odor. These are things we know firsthand, because we’ve experienced them too. And Jesus, God himself, lived on this same earth we walk on. So it is fitting that I get antsy to celebrate that. Christmas is more than a day though. This year I’m trying to not put the actual day of Christmas on a pedestal. It’s only 24 hours, and whatever picture of a perfect Christmas I have in my head will not come entirely true. And that’s ok, because Christmas is more than about celebrating a specific day. My anticipation is directed towards more than tomorrow. This is the part of Advent I think I had been missing though: the waiting doesn’t end on Christmas. The eager anticipation of that day is a taste of what I should be anticipating each and every day as I wait for Christ to come again…What happened in a stable as foreshadowing of who will come again…What we already have, but not yet in full. Christmas isn’t just a day, it’s a state of being. Of being in continual hopeful expectation and longing for the day when Christ will return. And that is something worth getting antsy about. p.s. How do you celebrate Christmas? How can you keep it as a reminder that Jesus will come again? Today I will go to a wedding. I will sit in the church, and likely tear up as the bride, my friend and former roommate, walks down the aisle and is married to her best friend. I will congratulate them both, tell her how beautiful she looks and how wonderful the ceremony was. I will find my seat at the reception hall, listen to speeches and toast the happy couple. I will make small talk with the people at my table, enjoy my dinner and sip my wine. I will watch them cut cake and take a picture of their first dance. I will dance until my feet are sore, and hope to catch the bouquet. As though somehow this time, catching the bouquet really will result in me finding the elusive guy. Because, as it has for all the weddings I’ve attended, the “Guest” line remained blank on my RSVP card. I still enjoy weddings, even in my singleness. They are beautiful, a celebration, a display of love. Weddings are a reminder of hope. Hope that I may one day find what I currently do not possess, and hope and well-wishes towards this new couple. But I cannot deny the dash of melancholy they bring. The desire for what I may one day have, but not yet. In no way will I allow this to detract from my enjoyment of the wedding; another single friend and I will ride together, sit by each other, and have a grand ol’ time together. And maybe remind each other that we are not done, our stories not finished. p.s. Ah, weddings…how do you feel about them? Much of my weekend so far has been spent grading papers, which is giving me a new appreciation for teachers and professors. In the future, if you get a paper or test back with food stains on it, don’t judge. Grading is hungry work. Besides increasing my appetite, I’m finding it to be interesting in other ways. Many of the papers I’ve graded today have been about the seven deadly vices, which are things I don’t think about often–perhaps because doing so is not overly pleasant. Anger. Lust. Envy. Gluttony. Vainglory. Sloth. Avarice. Even the words have a menacing look to them, as though they might bare their fangs and hiss at me. The thoughts, desires, and actions these words stand for are much more menacing than their letters. As I read papers detailing some of these vices, it is hard to keep from cringing; my life is splayed across the page, in all the examples and stories. Even vices I would at first be quick to dismiss play some role, however small, in my day to day life. I’ve skimmed the book the students based their papers on–Glittering Vices, by Rebecca Konyndyk DeYoung–and it is incredibly convicting. No one can completely deny the reality of these sins. Yet in the book, and in these papers as well, I can’t help noticing shimmers of hope. Or, more accurately, grace. Hope because of grace. Because though DeYoung’s words, and also my students’, cause me to squirm (and rightly so), there is much more to the story than being consumed by the menacing scourge of the seven deadly vices. DeYoung offers concrete suggestions for recognizing and combating them in our own lives, but they are meaningless without grace. Grace that opens up the possibility of improvement. Grace that offers a new way to live. Grace that means my own inability to defeat these vices is covered by Jesus’ perfect ability to do just that. Shimmers of grace that overwhelm the glitter of vices. In the span of my ten minute drive to work yesterday, I decided it was time for a pet. Seeing as my house is still fuller than normal, a goldfish seemed the best way to go. Needing a quick way to get as many opinions as possible, I posted a Facebook status announcing to the world my decision to acquire a goldfish, and requested suggestions for names; preferably biblical, male names. Though I received many good suggestions, none seemed quite right. 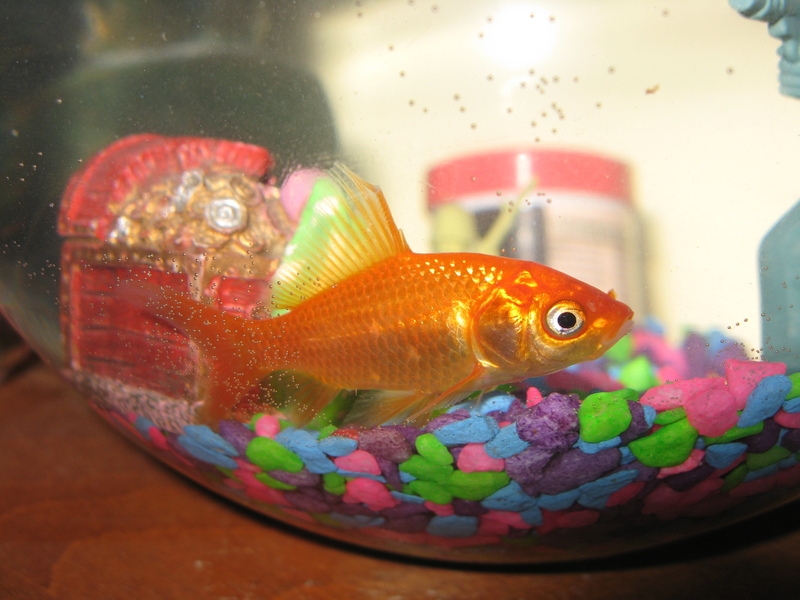 I noticed Manasseh because I had names on the brain, and thought, “Manasseh would make a pretty good fish name.” Then I read his story. Manasseh became king at the age of twelve, and “led Judah and the people of Jerusalem astray, so that they did more evil than the nations the Lord had destroyed before the Israelites.” (II Chronicles 33:9, NIV) He built idols, worshiped the gods of the nations surrounding Judah, even sacrificed his own sons—not what God had in mind for the ruler of his people. So God let Manasseh be taken captive by Assyria. Only then, after being ripped from his land and position of power, did Manasseh see his foolishness. It’s a redemption story. As I quoted here in a post about everyday redemption, to redeem is to buy back. To set free by paying a ransom. To deliver from sin and its penalties, as by a sacrifice made for the sinner. It is one of my favorite quotes about redemption (and I’ve used it before over here). As one of the worst kings Judah ever had, Manasseh was a prime example of violating God’s creation by blatantly disobeying what God had told him to do. Yet God heard him, rescued him from his plight, and redeemed him. And so, Manasseh. An unlikely name for a goldfish, perhaps. If he goes the way of his predecessors, he may not swim for long; but even so, he will serve as a reminder that redemption is not only possible, but a reason to hope. A fitting thought to begin a new year, I do think. Because all it takes is a glance to see brokenness in the world. That brokenness results in lots of messy complicated things that may get left behind, or may carry over into coming years. There’s a fair amount of ugly, and some bruises, scrapes, and scars. But, despite all of that, there is nothing wrong (and everything right) with looking to the future with expectations for loveliness. That messy stuff will come along too, but it doesn’t need to win out over thoughts of the good. Right now is a perfect time for hope.